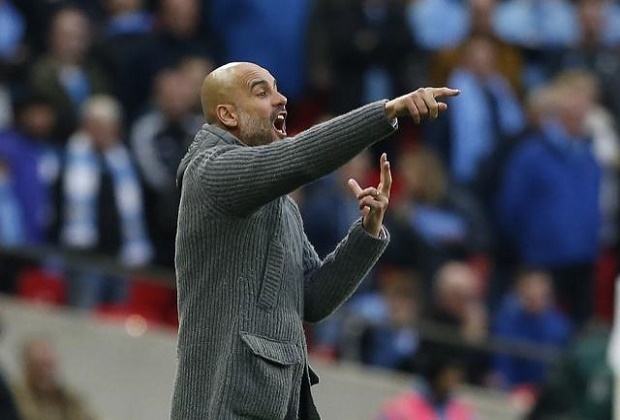 London (AFP) – Pep Guardiola claimed he still doesn’t believe Manchester City can win the quadruple after his side reached the FA Cup final with a 1-0 win over Brighton on Saturday. Guardiola’s men were well below their best in the Wembley semi-final, but Gabriel Jesus’s early goal got the job done. City will play Watford or Wolves in the final on May 18, but before then they hope to have retained the Premier League title and reached the Champions League final. Currently two points behind leaders Liverpool with a game in hand in the Premier League, City go to Tottenham for the first leg of the Champions League quarter-finals on Tuesday. Having already won the League Cup, an unprecedented clean-sweep of all four major trophies is within touching distance, but City manager Guardiola refuses to talk up his team’s chances. “My opinion is that nobody has done it (won the quadruple), so why can we do it?,” he said. City laboured to kill off Premier League strugglers Brighton in a hard-fought semi-final lacking many thrills. Guardiola praised Brighton’s resilience and admitted he was relieved to get the win. “It was a semi-final, Brighton are an incredible defensive team, we knew that set-pieces were huge, massive. We conceded too many but only one dangerous situation. We are in the final, we are there,” he said. City defender Kyle Walker came off at half-time after suffering a first-half knock. Walker was also fortunate to escape with a yellow card after a VAR review of a 32nd-minute incident when the England star reacted to a challenge from Alireza Jahanbakhsh by aiming his head at the Brighton player. “I didn’t see the Kyle Walker incident,” Guardiola said. “We are losing players every game but still we will try to do it. Brighton boss Chris Hughton was adamant Walker should have been sent off. “I have seen it a few times and my opinion is it is a red card,” he said.